Please tell me this doesn’t just happen to me: You know when you love a dish so much, you don’t even want to risk ordering it when you’re out because it’s so often disappointing? Hopeless child of the 80s and 90s that I am, tiramisu is a top five dessert for me but I almost never eat it for this messy reason. At its finest, little bits of cake are almost saturated with bracing espresso then burrowed in a cream that’s ethereally light and fluffy for containing an unholy amount of mascarpone and dusted generously with cocoa or shaved unsweetened chocolate between each layer. The sum of the parts isn’t overly sweet but quite rich, ideal in small doses. It is heaven. But I finally found my solution: small-batch tiramisu, that is, utterly perfect, completely uncompromised tiramisu made and served in small enough cups for an occasional luxury but not so much that two adults end up eating a casserole dish of triple cream. Furthermore, they’re so tiny and funfetti-free, the little people might not even notice that you’re not sharing. I use these cups for the small portions and these for large (not shown in these pictures). Remaining recipe notes at end. In a medium bowl, beat egg whites until stiff. In a larger bowl, using same beaters, beat egg yolks and 1/3 cup sugar until thick and pale yellow, 3 to 4 minutes. 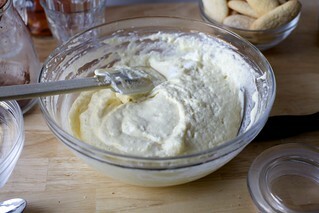 Beat in mascarpone cheese until combined, and continue beating another minute for extra fluff. Beat in marsala until smooth. 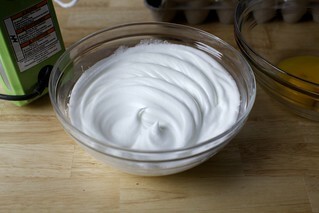 Gently fold in egg whites until combined, trying not to deflate the mixture. It will be a loose, soft, creamy custard. 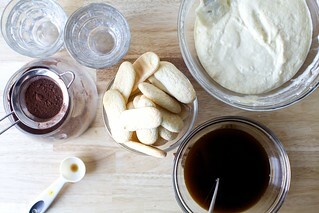 In a small bowl wide enough to dip cookies into, combine the espresso and 1 tablespoon sugar. Set aside. To assemble small cups: Dip first cookie in espresso mixture until almost fully saturated but not falling apart. Break in half and place the first half in the bottom of your cup. Spoon 1 generous (I use a measuring spoon, but heaped a little) tablespoon cream over it. Repeat with second half of first biscuit and another spoonful of cream. Dust with cocoa powder. Dip second cookie in coffee and break in half. Place side-by-side over cocoa then top with 2 generous tablespoons cream mixture, which should take you nearly to the top of the cup. Dust with more cocoa. Repeat with remaining cups. 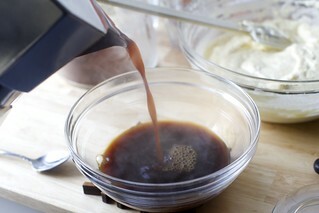 To assemble large cups: Dip first cookie in espresso mixture until almost fully saturated but not falling apart. Break in half and place side-by-side in the bottom of your larger cup. Spoon 2 generous tablespoons (I use a measuring spoon, but heaped a little) cream over and dust with cocoa powder. Dip two biscuits in espresso mixture and break in half. Place 3 of the halves on top of the cocoa powder, cover with another 2 generous tablespoons of cream and cocoa powder. Dip a 4th biscuit in the espresso mixture, break it in half, and place these two halves plus the leftover half from the previous layer on top of the cocoa. Dollop more cream over and repeat with remaining cups. If you can bear it, let cups chill in fridge overnight to set. Before eating, you can dust them with fresh cocoa powder for a prettier look. You can flavor these with 1/4 teaspoon vanilla or 1/8 teaspoon almond extract and a little lemon or orange zest if you wish. Heat oven to 400 degrees F and line a large baking sheet with parchment paper. In a medium bowl, beat egg whites until stiff. Set aside. In a large bowl, with the same beaters, beat egg yolks with 1/3 cup sugar until thick and pale. Gently fold in egg whites, then fold in flour, trying not to deflate the mixture. 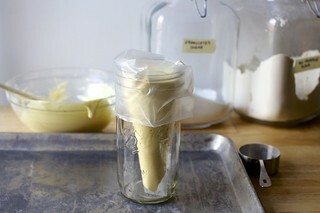 Pour batter into quart-sized freezer bag and snip off end to about a 1-inch opening or a pastry bag with a large round tip. Pipe cookies into 3-ish inch strips, with a 2 inches between each cookie. Sprinkle each with a pinch of granulated sugar and a light dusting of powdered sugar, then bake cookies until faintly gold and dry to the touch, about 6 to 8 minutes (although I found it to take up to 4 minutes more when using a lighter-colored cookie sheet; better to check early). Let cool on tray for a minute then transfer to a cooling rack to cool completely. If you’re getting a lead on these cookies and won’t need them until the next day, leave them out uncovered so they can dry out as much as possible. First things first: You might have noticed I made my own savoiardi, not because I cannot get them around here and not because I think your tiramisu will suffer without them. Nope, quite simply, I realized they contained a few as three ingredients and had to see for myself if they were as simple as they sounded. Turns out, they totally are so I’m including the recipe I settled on (after a couple flops, let’s not talk about it) below. Should you be purchasing ladyfingers, look for crisp ones. I understand that at some point, American-style ones were softer and Italian-style ones were more crisp. (I feel like I only see the latter these days, but should you end up with the former, dry them out in the oven for a bit until they have a snap to them. You want them to be able to absorb. This recipe is tweaked from one of my favorite cookbooks to curl up with. I talked about it previously here and here. This version is halved, uses a bit less sugar. I used the rum in the coffee but would skip it next time; I think the marsala is sufficient for good flavor. Marsala is the traditional alcohol in tiramisu. You can use sweet or dry. Sweet is more typical for desserts but I only keep dry around. After reading this from Cook’s Illustrated, I felt confident it would be just as good, and it was. My second choice for tiramisu is rum. I know brandy works fairly well too. I’m not crazy about Kahlua because the dessert itself is naturally flavored with chocolate and coffee, no need to add it artificially when you could just use rum. For both brandy and rum, I might use a touch less because marsala has a lower alcohol content. As for tweaking this recipe to make it less risky, you could use pasteurized eggs, and at minimum, you should use eggs you’re as confident one can be are fresh. You could use decaf espresso. I am sure someone somewhere skips the booze or uses less. All work. You’re making this for you, not me. But if you’re making it for me, please don’t. And if you’re on the fence about making it this indulgently, do it once and if it’s terrible, you can send all the extras over here. Ooooh! You have just made my husband’s day/week/year. This is his absolute favorite dessert and other recipes have produced only mediocre results. I was so hoping this was what you were working on when I saw your IG Story this weekend. Awesome, awesome, awesome (and just in time for Valentine’s Day!). This sounds amazing!! I really love tiramisu but I’m a recovering alcoholic, so sadly haven’t had any since I got sober. I know the alcohol seems to “make it,” but any ideas for what I could substitute? Or, perhaps, slowly simmering the marsala on the stove for an hour might help with alcohol content? My mother used to replace the alcohol with maple syrup for the kids. It does change the taste quite a bit though! I never use alcohol and it tastes great. Actually the main recipe I use (from the New York Times) does not call for any alcohol. I agree with above — try it without any alcohol, it should be great regardless! Agreed you don’t absolutely need it. You can add a little vanilla or almond extract if you like to give it a little bit of sweeter taste. i am italian and live in Italy and never once had tiramisu with alcohol in it! When we were in Italy 7 years ago, we took an amazing cooking class in a private home, and Alessandra said that in Italy they never use alcohol, only really strong espresso. We have her recipe and have made it several times. Don’t miss the alcohol. It makes a HUGE pan, however, so I’m anxious to try this small batch version. I think it would totally still taste great! I bet if you just went heavy on the espresso and added in a little bit of really dark brown sugar (for that rich sweetness that the rum gives) it would be just as delicious. And I also agree with the other comments about the vanilla! I think that would taste great. I agree, absolutely no alcohol needed, in fact, I’d never want it with alcohol. Take good cocoa, good mascarpone, good eggs, that’s all you need. I never understand people who think that tiramisu is soo outdated. It’s just the most amazing dessert. Now I’m craving tiramisu :) This may be because we’re Italian-Canadian, but when I was growing up my mother always made a special batch of tiramisu for the kids where she replaced the espresso and booze with maple syrup. The sweetness of the syrup made it more palatable to kids picky tastes too! This is the part where I lament my inability to insert one of those giant emojis with the hearts for eyes into the comments box, because I am pretty sure if I held up a mirror I would look just like that. My first thought upon finishing reading the recipe is how much I’d want to put these in mason jars – no wait! Don’t stop reading! – because they have lids to seal them and make them portable. The restaurant at my last job used to do that with chocolate pots de creme. Can you imagine opening your lunch bag to find one? I’m drooling. 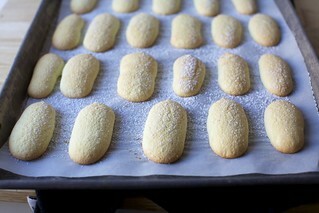 Has anyone tried to do the ladyfingers in a different shape? Maybe to fit in aforementioned mason jars? The 8oz size? OMG! tiramisu is my favorite dessert but I have no portion control so never make it but this is perfect!! Thank you! Oooh, yes! I love, love, love tiramisu and the restuarants in my part of the world always seem to mess it up. Let’s see if I can recreate the magic at home, with your help. Yes, there were two sentences missing! Sorry for the trouble. I literally hit publish on this and had to run off to the kitchen for an insane photography project and totally didn’t see the comments until now. Now fixed. So sorry — there are huge chunks of text missing from the post (such as the yield and the info on where to get the cups) and I cannot figure out how this happened. Will fix right away. Figured it out — broken link. Now fixed. Sorry for the confusion and delay. This is a game changer :) Question: what constitutes a ‘small’ or ‘large’ cup? Now added. For some reason, didn’t initially show up. Sorry for the trouble. My kids are 10 and 6 but I’m seriously considering making a big batch of this, coffee, liquor, raw-eggs and all, for everyone to consume tomorrow for Valentine’s. Does that make me a bad mom?! 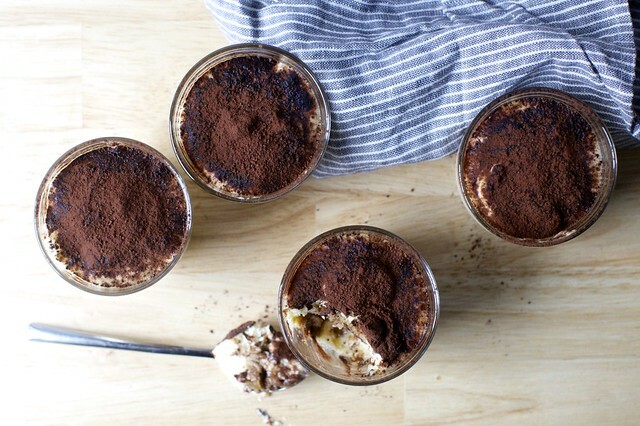 My kids love tiramisu- are they not supposed to have it?! Seems cruel to exclude them! This looks delicious! Normally I would not ask about substituting ingredients, but if I wanted to make this gluten free, what would be the best gluten free substitute for the flour in the Ladyfinger recipe? Look for GF lady fingers – I can get them prepackged at my local specialty grocer. They’re produced by Scharr, the German company that makes GF cookies and crackers. Is the beginning of the ladyfingers recipe missing? I’m honestly not sure how scary acid snow is (it was a big thing that we heard about when we were kids, like acid rain, although you never hear about it anymore) but if you’re comfortable with the little ones eating snow, scoop some into a bowl for them, and pour maple syrup on top. The historical recreation/living museum we went to my entire childhood would serve it all winter long. Maybe it’s a New England thing? But this could be a special dessert for them while you enjoy this one. This looks awesome Deb – can’t wait to try it! How many servings would you say it makes? Seeing this small batch recipe is perfect for tomorrow! About beating the egg whites…soft peak or stiff? I think I’ll make the savoiardi today and put it all together tomorrow. Thanks for this one!!! Egg whites stiff. Fold them into yolks. Missing step now added, sorry for the trouble. This looks so yummy! I can’t wait to try it soon! I have been thinking about tiramisu nonstop since having a delicious, homemade, way too large serving of it at Thanksgiving. I cannot wait to try this recipe. Breastfeeding cravings, for me, are way more intense than pregnancy cravings. I’m fairly certain I’m making this tonight. Sometimes I don’t enjoy eating out because I think I can make better food at home . I get aggravated if I’m paying for a meal and it isn’t carefully prepared. I’ve never tried my hand at homemade tiramisu. This recipe makes me think maybe I should! My recipe for tiramisu comes from the Italian owners of a Tuscan villa I rented years ago with my family, when online vacation rentals were just starting and were quite dicey. We did cooking lessons–a great idea if your host is up for it (we are! ), and tiramisu was on the menu. The alcohol was amaretto, which marries well with coffee and adds a bit of sweetness. They (and thus I) used store-bought ladyfingers, and in fact the supermarket sold rectangular ceramic dishes that were EXACTLY the same size as a package of lady fingers. How is that for economic efficiency? The hosts’ recipe used seven eggs (separated) and seven tablespoons of sugar, so it wasn’t overly sugary. But it was for a full ~9×13 dish. I made it at Christmas in a last-minute move when the dessert-bringer wasn’t able to show up. Without my recipe in hand, but mostly in memory after all these years. Turned out great. Cudos for making your own Savoiardi (shhhhh… there’s a typo), I must try this some time though often, ahem always I’ll just buy them. Great to rediscover an old favourite, I’ve made one with raspberries a while ago and loved it so much that I was surprised why we had forgotten about it (https://thejameskitchen.wordpress.com/2015/04/02/raspberry-tiramisu/). And yes, small portions are great because I remember always carving an extra inch from one side of the dish, then another tiny bit, perhaps a smidgen here and there and suddenly the big dish was empty. This looks amazing and I love your photography! Oohh I love tiramisu! While I think it is in fact perfect as is, I strongly encourage you to try the “Irish Tiramisu” version with Bailey’s in both the espresso and egg yolk mixtures. Heavenly. Did I miss a step where you whip the egg whites in the savioardi? Top 5 dessert for me, too, and your version looks soooo perfect!! This looks amazing and I really want to make it for my wife as it is her favorite. It appears that the beginning of the ladyfinger recipe is missing. Is the first step just to beat the egg whites? Sorry for the confusion; I fixed it. You do start with egg whites. I do that because if you start with egg yolks, you have to wash your beaters before beating the whites or they won’t whip. But egg whites on the beaters won’t stop the yolks from whipping, so I do it out of order. MMMM…”Sugar on Snow”! What a treat for anyone, you don’t have to be a kid to love it. When my children were small I put a bowl outside to catch the snow ( theoretically- -fewer germs that way) and we did it up for dessert many a time. The other lovely thing for autumn was roasting apples in our burning leaf piles. We now can’t burn leaves where I live, but I imagine a pile of raked leaves with some foil covered apples in them could still happen in many parts of the country. If you are lucky enough to burn leaves where you live ( the smell of them is great BTW SO autumn), throw some apples in for your kids and make a memory to treasure! I love the portions for the tiramisu. I live alone so could (in theory) have one a night for 4 nights this way, instead of the entire bowl. Maybe. Thanks Deb. THANK YOU. We’re out in Northern California Wine Country (Sonoma County) where the vines are trimmed yearly, and yes burnt. So….you know what’s gonna be happening here next burn day, right? (tho in my case, it’ll be blackberry trimmings). This is looking SO good, this is Valentines day in a dessert! Thank you for sharing! This is perfect timing for Valentine’s Day, I didn’t know what to make for dessert but I do now! I love your commentary almost as much as your recipes. I noted that your recipe does not include heavy cream, only marscapone. Just want to make sure that this is not an omission – though there is no reference to it in the preparation instructions. I’m also looking to make this for Valentines Day! Whenever i try to mix mascarpone with the egg mix, the mascarpone tends to separate out. What am i doing wrong? Both items i use at room temperature. I beat the mascarpone into the yolks (which are thicker/more dense) until it’s smooth and then fold in the whites. If you fold in the whites first, the mascarpone won’t mix as smoothly. Hmm, I had the same problem as SHANKYPRAS. I followed your direction to mix the mascarpone with the yolks, then added marsala wine before I folded in the whites (all in my kitchenaid). It looked like a broken sauce & it was pretty runny :( I think it will taste fine (will be eating it tonight), but will not look very pretty. Any other suggestions? I am so laughing. While everyone is posting about leaving out the alcohol for the kidlets, my thought was leaving off soaking the lady fingers in the coffee for the kids version – and that the plain cake smothered in cream with a bit of etoh – would be a blessing!!!! (a few berries sprinkled here or there just make it all that much more kid special, and might differentiate between kid cups and adult cups). And then my second thought, just like Ginnifer, was also about Mason jars. This is a PERFECT mason jar dessert. Thanks for the lovely recipe! And for the story, I laughed with the non child-friendly/child-incubation-friendly ingredients…so true! i love the glass cups! where are they from? I made this tonight in about 15 minutes. I was a little worried about how strongly it tasted of marsala, when I tried the cream by itself. But when I served it, my family proclaimed it delicious and very authentically Italian. Thank you for the inspiration to make this impressive and tasty treat! whoa. I love small desserts for dinner parties because as a host, you don’t have to cut a huge cake or make a mess. dessert is as easy as a mason jar and a spoon. tiramisu is a game changer. I can’t wait to try this! How did you know I was just thinking about tiramisu and how I haven’t made it in years? I was explaining to a friend yesterday how, during college, I would drive the Italian grocery 45 minutes away just to get the mascarpone. I learned to make it in Italy from my Italian professor and it was the best. Can’t wait to try your version. I’ll have to find an excuse to do so very soon. Whats the temperature for the oven please? Also sorry do you sprinkle sugar before they go into oven or after? Whoops — can’t believe I missed that, before! Thanks for the heads up. Now fixed. Deb, you may be interested in this Tiramisu recipe by Marco Pierre White which uses eggs heated (carefully!) to 50 degrees Celcius in a sabayon. I use this recipe because I don’t like the taste of raw eggs. I love making the small batch version, especially since in glass cups it looks so cute. But just wanted to add something: almost no one I know here in Italy, these days, uses any type of alcohol in theirs. Like almost never. It’s a very old fashioned taste, and I think that since their are so many people who don’t like it, restaurants started doing a version without it, which has become the norm. Very good to know, thanks! And will be great for people asking to make it without to know. Hm. 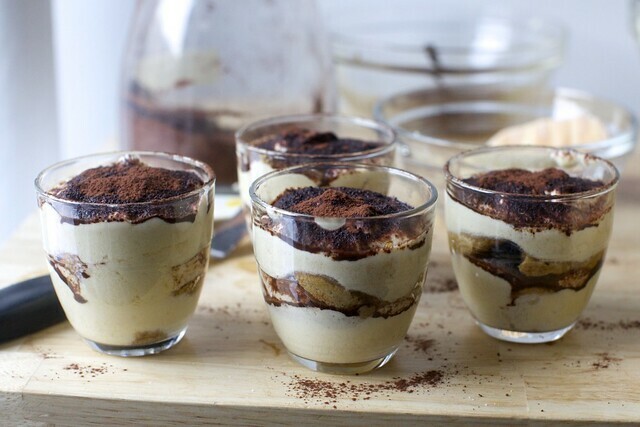 As an Italian child of the 80s 90s I have to tell you: we always ate tiramisù. Always. Yes, even if there was coffee/some liqueur/raw eggs. Acqually, my dad sometimes made me for breakfast “uovo sbattuto”, a raw yolk beaten with sugar. I loved it. I never make tiramisu with raw eggs because I don’t like the taste and find it gets quite watery the day after (not that it lasts that long, but I much prefer to make it in advance for the flavors to marry). What I do is similar to the Marco Pierre White recipe linked by Jane Starr, but with a very simple sugar syrup instead of plain sugar (just sugar with enough water to moisten it, and brought to a boil). I make a sabayon-style custard by whisking the yolks with it in a double boiler. It gets so silky and smooth. 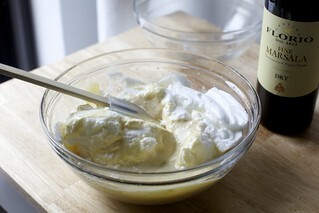 You can also make a simple custard (crema pasticcera) and mix it in equal parts with mascarpone: while it does not sound very authentic I can assure you won’t be missing anything taste-wise, and it is much easier and also lighter this way as it lets you cut the mascarpone quantity in half (if “light” and “tiramisu” could ever co-exist in the same sentence). As for the egg whites, I never used them until I discovered the wonders of Italian meringue – that is, egg whites beaten stiff with a sugar syrup. You have to reduce the sugar amount in the custard of course, but it makes for an exceptionally fluffy and light cream that does not get watery and does not taste like raw eggs at all. I’m loving the sound of the lady fingers by themselves, maybe with some zest. Not that I don’t love tiramisu. I’ve made tiramisu several different ways but starting from scratch, scratch has not been the case. I can’t wait to try this. Looks amazing and I do love the idea of small batches. Will let you know how mine turns out. Hi Deb! Thanks for the recipe, tiramisu is my most favorite dessert, and the homemade version is so much better than anything I’ve ever had in a restaurant! I wanted to add a quick note that when I lived in Italy briefly, my host mom used to make a small batch of tiramisu for the young ones (yes, raw eggs, but still), she would make a batch of hot cocoa and dip the biscuits in that and then make a tiny dish for them to go alongside the adult version. Might be a good compromise once yours get a little older! I’ve also done the same for my non coffee-loving friends and they loved it too. Was totally thinking of this! I do owe the kids… maybe a hot cocoa dip and a marshmallowy custard? Love that tiramisu is making a comeback! 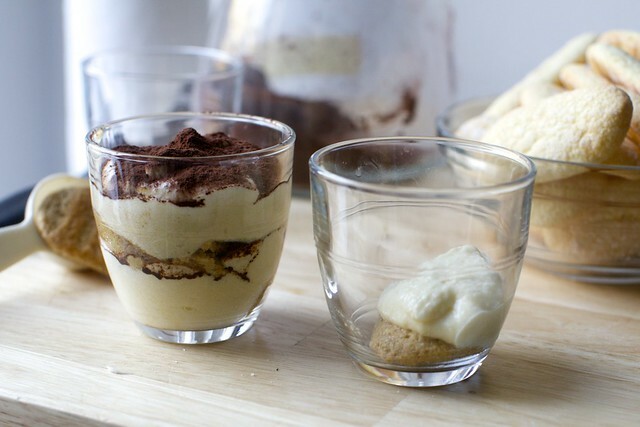 I love your recipe idea regarding small portion tiramisu and I have to agree with others that you don’t need the alcohol. We have some family members that can’t have it so we just use coffee. I don’t even make strong espresso, just regular coffee. We add a drop of anise extract to the coffee and we love the licorice flavor. Your lady fingers look amazing. Can’t wait to try them. I can see people being wary of raw eggs (even if I’m not–delicious when used appropriately) but I think there needs to be a genuine discussion about alcohol in desserts and children. I’ve yet to come across a dessert recipe that includes remotely enough alcohol to warrant a disclaimer or replacement option so kids can enjoy it. There is more alcohol in most children’s cough medicine than in a single serving of tiramisu. Sure, the kids might not have a taste for the alcohol flavor but I don’t think you’ll need to worry about the little ones getting tipsy. My mom has made dessert trifle my entire life. It is one of my favorite childhood memories. It was also soaked in brandy. Exposure to new things, in moderation, can be a good thing. I agree, I don’t eat tiramisu because I like the way I make it better, 2 kids later, I think its finally time I can bring this back into my life. Thank you for the reminder! So perfect love Tiramisu so much! As a fellow child of the 80s and 90s, this is also one of my favourite – ever – desserts; though I think it is pipped at the post by a gloriously gooey, rich and very, very sickly sticky toffee pudding. As I am currently five months pregnant, this has been added to my ‘day after birth’ meal which will include a starter with garlicky pate, and a main course of RARE steak in a spinach, mushroom and cream sauce. The best bit? My OH has promised to cook the lot! The worst? As a mother to a newborn (and almost 11 years to the day since I was last in that position), I’ll probably be face down before the steak has even hit the pan! Haha. Thank you. This is very outdated. I’ve been using a Canon 5D Mark II and a 50mm lens and only shooting in natural light for basically every photo on this site for the last 7 years. I always think about getting a new camera body (mine is nearing the end) or trying a new lens but never budge. These look great! How long did the entire process take you? I didn’t make the cookies the same day but the mascarpone custard and assembly process, including making espresso, is fairly quick. Definitely a little messy since you’re dipping and breaking cookies and sifting cocoa over cups. I feel like if you had all of your ingredients and baking sheet ready to go, the cookies could be done in under 30 minutes. I’m about to make your recipe for red split lentils with cabbage – my other recipes for using red lentils cook in 15-25 minutes. Do you really cook these one and a quarter hour? It supposed to be very deeply braised and tender but if you’re happy with the texture sooner, I’d say no reason to keep cooking it. Thanks! I have a 25 lb. bag of red lentils so recipes using them other than my favorite dal are a plus! This is amazing. Put it together last night and let it set up for 24 hours. Maybe the best dessert I’ve ever had! Dumb question: Would you say this recipe would be just as amazing if I assemble a large vat of it — or is it one of those “this is the best recipe for a miniature version of something and it loses that je-ne-sais-quoi if scaled up”? Only asking because once in a while you get a cupcake recipe that just doesn’t translate to bigger format for some unknown reason, or a cookie recipe you should never try to halve… that kind of thing. Making an Italian feast for my birthday and really want to include Tiramisu… but… how do I put this into words…. I want lots of it. Yes, totally, in fact, I really wanted to make a suggestion of what size dish to use but only made this yield once. But absolutely. Do you think it would work well to alter the shape of the lady fingers to fit more perfectly the shape of the serving dish (like you did in Chocolate Peanut Butter Icebox cake, which was delicious), or is the imperfectness of the cookie layers part of the charm? Lol, you know me! I thought so hard about this and was very, very tempted. I think it would work best in more of a trifle dish or glass straight-sided bowl because of the moisture. I could see some slipping out of a springform and if no mold is used, the custard is so soft, it might spill out. This may be heresy, but I’m going to ask: is there any way to do a reasonable approximation of this without dairy? It looks like mascarpone is the only milk in it…is there any approximation that might pass? Maybe make a zabaglione? It’s a custard-like treat with egg yolks, marsala wine and sugar. No dairy. The right flavor profile. I skip the eggs and sugar and mix mascarpone and low fat creme fraiche together for a lighter and lower calorie result. I always grate in some orange zest. I’ve also made it with half and half mascarpone and low-fat custard. This is might be a better choice for those who might be vulnerable to eating raw egg. Nothing wrong with using Kahlua if that’s what you have. Personal choice. The point here though is that you can play around with your creamy mix and make up a one or two person quantity if that’s all you need. Two questions: If making the ladyfingers, when do you dust them with powdered sugar? Also, I don’t have an espresso machine. Can you substitute strong coffee for espresso? I’ve never had a proper Tiramisu before! You mean ya’ll don’t hop your kiddos up on espresso and rum regularly? Just kidding. I take for granted all of the things we can make without concern while we are kid-less! Tiramisu is fabulous and this one looks truly lovely. Love the commenter below who suggested hot cocoa for a kid friendly version! Great idea!! This sounds like a brilliant addition to my modest dessert repertoire so I’m hoping there might be a possible substitute for raw egg whites and yolk. Deathly allergic to uncooked eggs. I scanned all comments to date and couldn’t find an answer. Love your site, recipes, photos, and sense of humor! You can make a sabayon with cooked eggs or you can just mix the mascarpone with whipped cream and omit the eggs altogether. Both are delicious. I ain’t saying it’s tiramisu–I’m saying it’s delicious. would you think that the number of egg yolks should differ in this way? and also i didn’t understand the meringue method you described, the egg whithes would be still stiff as if they were raw? thank you for your description also, i’ll definitely use it for the yolks. love Tiramisu, but could not find lady fingers anywhere. Discovered that a double layer of graham crackers worked quite well, and tasted wonderful! Thank you, Deb, I will try this. Gratuitous comment: thank you so much for your statement about restaurant desserts often not being so good. Outside of the flourless variety I can’t think of any chocolate cake that excells, nothing ever being nearly as good as my lopsided Palm Beach chocolate layer cake, which of course is really Maida Heatter’s. This turned out absolutely phenomenal! It was a great Valentine’s Day dessert the day of, and even better the next day with leftovers! Tiramisu has always intimidated me, it seemed like a very difficult and time consuming dessert. But, the instructions were so clear and made it so easy to follow along. I made these yesterday to serve tonight, I added a splash of rum with the Marsala. It was absolutely delicious although the cream was a bit runny. I was very careful when folding in the egg white so I’m curious as to why that happened. The ladyfingers were a breeze to make as well. A little runny is fine. It’s looser than it will seem when you get it in a pan or served at a restaurant, but it should set up much more in the fridge as it gets cold and as the cookies absorb. Glad the cookies were easy. You can. I didn’t and it did get bit of skin after a couple days… erm, chocolate skin. Santa brought me a Joule for Christmas (my husband and I laughed and laughed as I have never been a jewelry person) and it has transformed my cooking. Absolutely tender and juicy boneless pork loin. Deli-worthy rare roast beef, sliced thin! And best of all, absolute certainty about when that roast is going to be done — a real plus for people who work or for cooking for a crowd — as most of it can be safely done ahead, and the times are remarkably flexible. I am such a sucker for Thai take-out, particularly for red curry and coconut soup. I order it on a weekly basis! But ordering take-out this often has been getting a bit costly so this homemade coconut curry soup comes in very handy. And it tastes a million times better too. Best of all, it’s so easy to make, and it doesn’t require ingredients that are hard to find. And if you’re not a fan of shrimp, you can easily swap that out for chicken, pork or even tofu for a vegetarian option. Either way, you’ll be sure to skip your usual Thai take-out and indulge in this budget-friendly version instead! 1. In a pan, heat butter adds garlic, ginger and fry. 2. Now add prawns and fry well. 3. Then add stock and cook. 4. When prawns are tender, add black pepper, salt, three ingredients paste, coconut milk, and cook on low flame for minute. 5. Then add capsicums, spring onion and cook. 6. In the end, add lemon juice and sprinkles coriander leaves and serve. Made this today. I only got 15 ladyfingers which made me a little sad. I assembled it all in a glass loaf pan, using three layers of ladyfingers topped by three layers of the mascarpone. After 2 hours in the fridge it was still a bit runny but good. Dry marsala is what I had and it was delish. Oh, I also sprinkled a layer of very finely chopped bittersweet chocolate somewhere in the middle and that added a nice extra texture. Have you (or anyone!) tried freezing these servings? Deb, you are like my what-to-cook-for-dessert-when-trying-to-impress-guests angel. Everyone loved it! I have made this twice this week. It’s so easy and delicious. I followed instructions the first time but my custard wasn’t light and fluffy. The second time I accidentally added the sugar to the egg whites before whipping and whipped the yolks with the marscapone but the custard was so easy to fold together and it was much fluffier! I also add 1-3 tbsp of amaretto and instant espresso powder to my brewed coffee. Could you please give me the British equivalent of measurements for the American cups. Thank you. These were incredible! I have the same cups, and it made ten–I used all the cookies from the recipe, which might have given me a slightly higher cookie to cream ratio, but no one seemed to mind. Went with the best eggs, mascarpone, and Marsala I could get, and used vanilla sugar (from the earlier apple strudel–great tip to keep some around!) in the cookies. Highly successful end to a night of wine and cheese with friends. Is it possible to pipe the cookies round to match the cup shape and avoid breaking them? Or would they not dry out correctly? I made this for a friend’s birthday and while everyone enjoyed it I feel there was room for improvement. 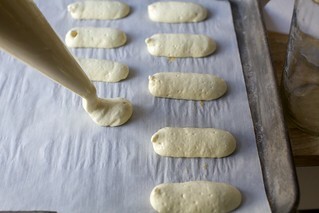 The lady finger batter was difficult to keep light and fluffy when adding flour at the end. It was not easy to incorporate and nearly deflated the batter. Couldn’t the flour be added to the sugar yolk mixture prior to folding in the whipped egg whites? The cookies tasted like a soft, stale cookie and even later after soaking in the espresso and chilling the assembled dessert, the texture still seemed off. The cream was tasty and saved the dessert. Bummer about the cookies. I made the ladyfingers and they were not as fluffly as the ones in your pictures, any tips for next time? Thanks!! I have a tip! If you’re making your own savoiardi, you can pipe them in the shape of your final dish. So, a rectangle or a square, or a circle, whatever. You’d have to brush the espresso on, of course, but that’s the only difference. I watched some chef on YouTube do his tiramisu this way, and I thought it was kinda neat. I was totally thinking about this too! Great to have confirmation that it works, thank you. Any ideas as to what i can sub for mascarpone? Where i live i have a hard time finding it-what other dairy product can i use? I just made this in about 40 minutes for my husband for his birthday. It came out fantastic! I would suggest to others do not use coffee or espresso ground coffee. The latter I got by mistake and it was too watery and thin. Still came out delicious but next time I’ll def use real espresso. Also, I didn’t have Marsala so I used Remy Martin Xo cognac and it really adds a lovely glamour. Thank you so much smitten kitchen for all your great recipes! I made this last night with a few slight modifications and it was delicious! I didn’t have marsala on-hand so I used 3 tbsp. of amaretto and 3 tbsp. of dark rum. My savioardi turned out a little softer than I would have liked but overall, the end result was great. Can you clarify what you mean by a cup of espresso coffee? I have an espresso machine, so should I pull enough espresso shots for a cup or should I pull two shots of espresso and then add hot water to make a cup (kind of like an americano)? Made this for Valentines Day and it was a total hit. I made the ladyfingers as well which were surprisingly easy. Overall easier than expected (this was my first time whipping egg whites!) and results were great. I used the full amount of rum in place of Marsala. Amazing! I halved the alcohol (used rum) and it was just the most perfect tiramisu ever. I made it in small ball jars (5 of them filled to the top but definitely could have made 6 as I had some extra). My lady fingers were a little small and skinny so I will make them a little wider next time for authenticity. I will make this again for sure! Thanks for another great recipe! Made this past weekend and the flavor was unreal but the custard a bit too runny. Any idea why this might have occurred and or suggestions to fix? I did let them sit for a full 24 hours in the frig before serving. Good grief. This recipe only calls for 1/3 c of marsala for 6 portions! My kids get more wine than that at Mass. That said, I did once make a HUGE recipe of Tiramisu with a super high alcohol content rum. I have to say, it wasn’t all my fault. The recipe called for a good quality clear rum, and when I went to the store, wanting to make the best Tiramisu I possibly could, I purchased the best bottle of clear rum I found. Turned out, it was a super, super high proof rum – and that Tiramisu was so overpoweringly alcoholic, even I couldn’t eat! I certainly didn’t share it with my kids. We ended up throwing most of it away. It was an expensive mistake. But, I now know to check what proof an alcohol is before buying it! Tiramisu is my favourite dessert but i’d never made it at home before which is strange because SK desserts are my jam. I made this for a family dinner last night and I can’t believe it took me so long to try. This was my favourite tiramisu ever. Thanks deb! What brand of marscapone do you use? I have tried a few different ones and it does not seem the same consistency as what they have in Italy. I’ve used a few — some are thicker, some have a very faint grain to them, some seem closer to creme fraiche. I’m sure all are better in Italy. Hello dear Deb, i ve been following u for a lot of years and whatever i have made is always right and sooo good but this recipe was a real disaster…. i made this exactly the way u described and i figured what is wrong. The minute i put the alcohol in the cream it became really loose and it ruined the whole cream thus the appearance and the taste of the tiramisu. It is a lot of alcohol and most of the very known italian chefs never put it in the cream but instead they put it in the coffee and it is usually around one or two tb. I am sooo sorry for this comment but i feel u need to change this. Good thing i didn’t do it on a dinner with friends, i tested it only with my husband. I’m sorry you had trouble with the recipe. I haven’t read about this happening from anyone else so tell me more, if you can. Regular heavy cream? Etc. Any other tweaks? Yes, yes, yes!!! I have made this twice now and it’s amazing! I bought adorable glass weck jars and it’s the perfect size for the “small” portion. I made the ladyfingers myself both times and let them dry out for 24 hours, they add a lovely cake-like texture to the dish. I also used dry marsala and it’s perfect. Don’t skimp on the Dutch process cocoa powder dusting, it gave it an excellent hint of rich chocolate flavor. Have to confess, I cheated and used Trader Joe soft lady fingers. But I love this recipe, so nice to serve. Please, please create a lemon tiramisu type recipe next. Love the detailed, easy to follow instructions. We made individual tiramisu cups in Rome while at a cooking class. When I told the instructor that most of us make it with marsala or some kind of alcohol in America, she looked at me like I was crazy. Have you heard of anything like that? This recipe looks to die for! I will have to try it.